How to increase the sound volume of (a part of) an audio track? 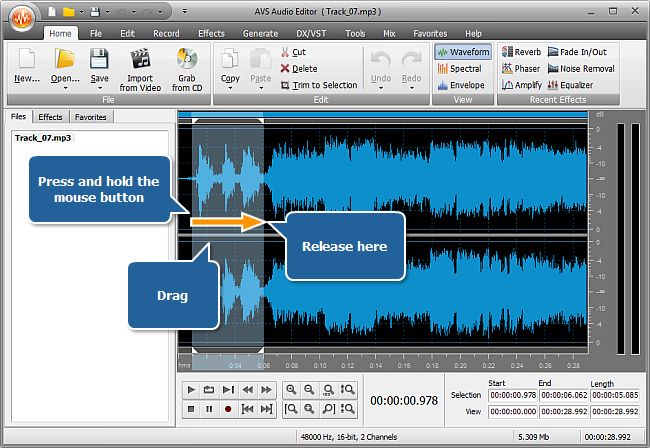 We often need to increase the sound volume of audio tracks. This can be done in 2 different ways depending on the type of the audio signal we are working with. Recorded voice has a narrow dynamic range as a rule. To increase the sound volume of voice recordings it is usually enough to apply the Amplify effect. See the Amplify section of our online help to learn how to do it. Music recordings may have a wider dynamic range. Trying to increase the sound volume of such recordings by using the Amplify effect may result in unwanted noises and crackling. Using the Compressor effect helps you avoid these problems. 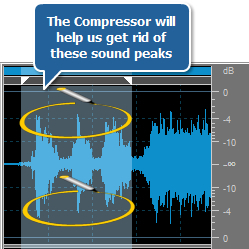 Follow the guidelines below to learn how to apply the compressor to your music. Note: see the Supported Audio Formats table to check the list of compatible audio formats. 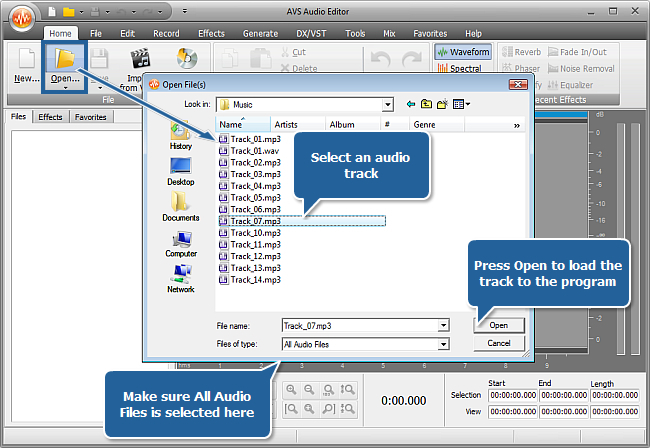 Click the Open button in the Open File(s) window - the selected audio file will be added to the Files tab. Note: the compressor allows you to achieve higher quality volume increase for music recordings in comparison with the standard Amplify effect. 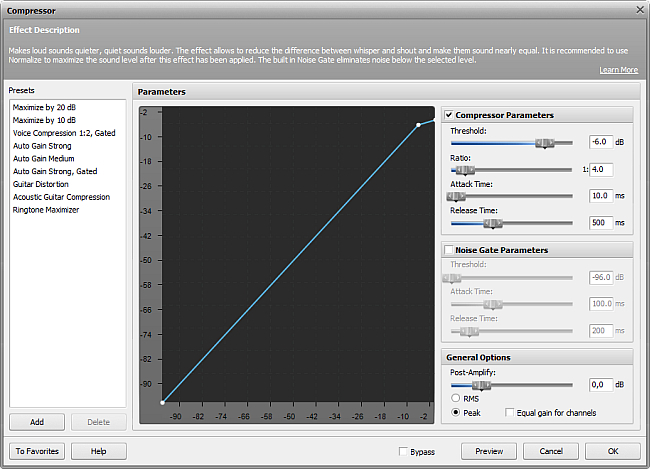 Use the compressor if you need to increase the volume of the audio track whose original dynamic range is wide. In the opened window configure the Compressor parameters. We'll need to set the Threshold, Ratio and Post-Amplify values. 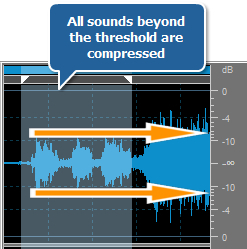 Threshold defines the sound level at which the compressor becomes active. 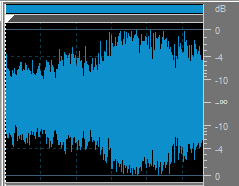 That is, if you set the threshold to -8 dB, all sounds above this value will be affected by the compressor. Ratio defines the amount of compression applied to the output signal. The bigger the value, the bigger the amount of compression applied. 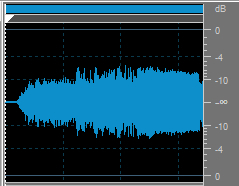 To get rid of sound peaks, define where they go above the overall sound level and set this value in the Threshold filed. Next set Ratio to 1:100 to compress all sounds down to the threshold value. 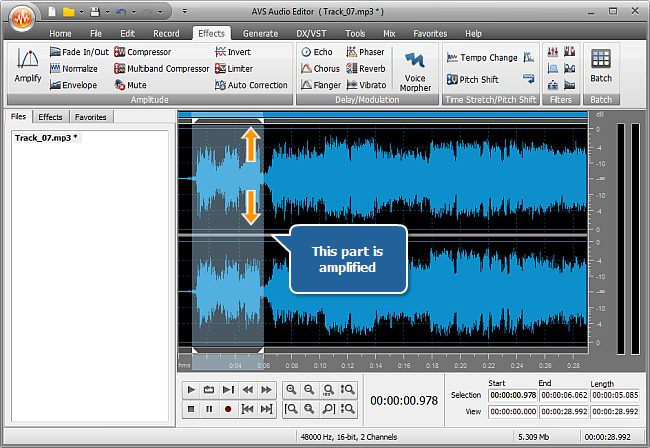 Post-Amplify defines how much the sound will be amplified after the compressor has been applied. It is recommended to amplify the sound at least as much as you compressed it. Use the Play control to listen to the results. Use the Undo button whenever you are not satisfied with the results of the editing performed. 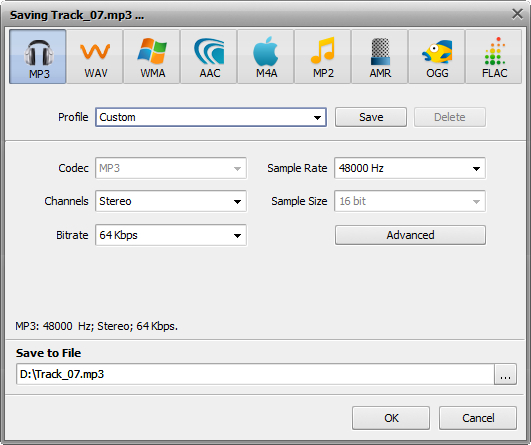 Configure the audio file parameters. Next select a location for the resulting audio file in the Save to File field and press OK. Wait a few moments while the program saves your file. That's about all. You can now enjoy the audio track quality.